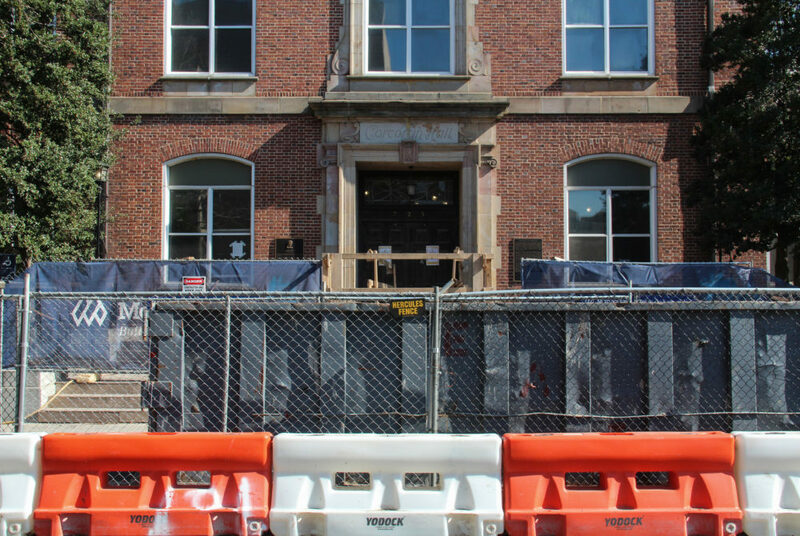 A student tweeted that she was harassed by construction workers outside Corcoran Hall. Construction workers renovating Corcoran Hall were accused of catcalling and sexually harassing students last week. Dean of Student Affairs Peter Konwerski retweeted a message from junior Hannah Hickman, who said in a tweet that she saw workers catcalling and sexually harassing students outside Corcoran Hall Feb. 11. Officials said they aim to take immediate responsive action whenever construction workers are reported to harass GW community members. “100,000 percent unacceptable to see the people working on Corcoran Hall this morning catcalling and sexually harassing students,” Hickman said in her tweet. Hickman declined to comment for this story. Konwerski responded to Hickman on Twitter, agreeing that the behavior was unacceptable and was not tolerated by the Division of Operations. University Spokesman Brett Zongker said upon receiving a report of harassment by a construction worker, University staff and project leaders or contractors will work together to take the “appropriate corrective action.” Action includes immediately removing workers from the project. “GW is committed to maintaining a positive climate for study and work and requires that workers at GW construction sites receive training that covers GW’s zero tolerance of harassment,” Zongker said. He added that if any community members are subject to harassment on campus, they should immediately contact UPD. Reports should include as much information as possible, like time and location of the incident and physical description of the perpetrator. “Concerns about harassment against any member of the GW community are taken seriously and addressed promptly when the University is notified about the incident,” Zongker said. Corcoran Hall, one of the University’s oldest buildings, is undergoing renovations for the physics department by adding faculty offices, classrooms, labs and study spaces. The University has committed millions of dollars to renovating Corcoran Hall and other academic and residential buildings. Officials faced a similar issue three years ago, when students complained that construction workers renovating City Hall, a former residence hall, were catcalling and leering at female students in the elevator and outside the hall. The Division of Operations then hosted a table conversation in City Hall the next week so students could speak with GW officials about their concerns. Eve Zhurbinskiy, a commissioner of the Foggy Bottom and West End Advisory Neighborhood Commission, said contractors should be mandated to undergo one to three hours of low-cost training to prevent harassment and ensure a safe environment. GW does not currently offer such a training. Zhurbinskiy added that this behavior from construction workers on campus was a recurring problem. She said a female friend of hers was harassed by a construction worker outside District House during construction but did not report the incident. “I think she thought that street harassment happens so often that it wasn’t important to report,” Zhurbinskiy said. Student Association President Erika Feinman said the University should provide students with guidance on how to handle harassment. Feinman added that the University has a responsibility to keep campus safe by listening to students’ concerns and taking appropriate action on a case-by-case basis.